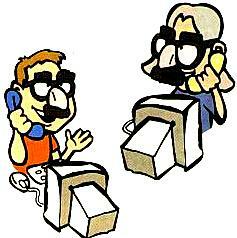 Internet Cello Society Communications "Let's Talk"
The webmaster wishes to caution young people using our "#Cellotalk" chat room, or our various bulletin boards, to be slow to give out their email addresses, street addresses, phone numbers, and personal information. I recommend that parents screen all email to their children. Most everyone participating here is a fine lady or gentleman, but it still is a good idea to be careful on the internet. Also, it would be polite to ask permission from your teacher or anyone else, before posting his/her telephone number, etc. Cello Chat message board -- THE place on the internet for cellists to post questions and answers about all kinds of cello stuff (no ads, no limit on number of posts). Also a great place to find a pen pal. NOTE: If cellochat goes down, "Cello Heaven" graciously allows us to use their Bulletin Board as an alternative. The Professional Performers and Educators Board. This board is strictly for adults (21 years old and above) who make a living from the cello. Cellists By Night -- For semi-pro or amateur cellists only. Go ahead and ask silly questions. Pros, please stay out! Young Cellists -- Strictly for cellists under 18 years of age. If you are older, please use one of the other discussion boards. New Instruments/Equipment -- hosted by Todd French. Events/Camps -- Post announcements here for camps and other cello events. Get A Job!--Please post job listings and advertisements for cello performers or teachers here. This is a free service of the Internet Cello Society. Here cellists and composers can interact about new compositions. #Cellotalk, the ICS real-time chat room. In order for this to work, we all need to be there at the same time. It would be a good idea to announce sessions ahead of time on one of the bulletin boards. Why Practice? or "My Father's Music;" a Reader's Digest article submitted by I.C.S. member Brandon Voo. The I.C.S. Newsletter-- "Tutti Celli"